Hi everyone! It's Godelieve here today. 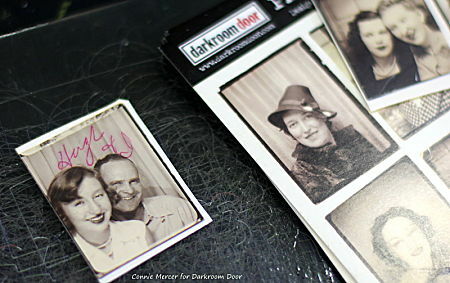 Here's a canvas I made with the Carved Birds stamps I designed for Darkroom Door. First I added texture to the canvas. I used modeling paste and stencils, Sizzix diecuts and Prima flowers. Then I applied a layer of gesso and painted the canvas with acrylic paint. I cut some twigs in the garden, and attached them to the canvas with stitches. Leaves and tags are cut from cardstock I had painted with acrylic paint. Stamped words from Darkroom Door's Seaside Vol 2 set on this tag. The Carved Birds are stamped with several Archival inks and cut out. I attached them to the canvas with 3D tape. 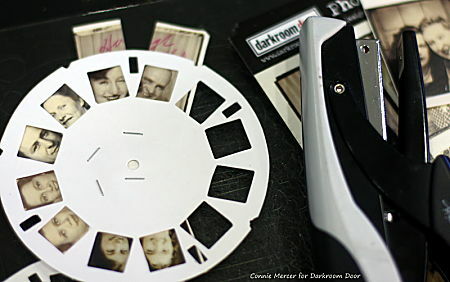 How about a quick birthday card using the new Darkroom Door Simple Sayings stamp set? The sentiment style had me thinking of a CAS design focusing on the sentiment. I paired the sweet sentiment with a little bouquet of flowers. This card is ready to send off to our niece for her birthday. 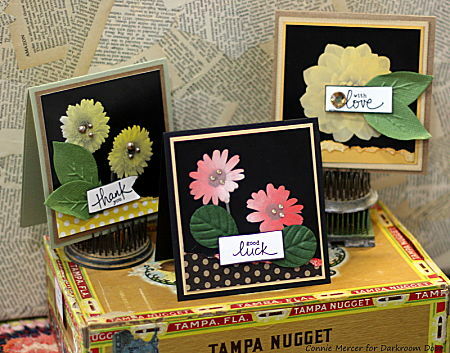 The Bold Blossoms flowers are stamped using Ranger Archival Ink - Chrome Yellow. The sentiment is stamped using Ranger Archival Ink - Magenta Hue. I sprayed a touch of pink using water and a watercolor pencil. Marjie Kemper made this art journal spread using Carved Birds, Vol I along with several of our large background stamps: Brick Wall, Triangles, Measuring Tape, and the 12-Up Shadow stamp. She started by spraying Dylusions Ink Sprays on the right-hand page and then pressed the left page into it to absorb the excess. She stamped all the birds onto clear packaging paper so she could move them around on the page while deciding where they would eventually end up. It's a good way to 'audition' a stamp without making a commitment. After making perches for each bird using the background stamps and a few spare (Dylusioned) tags, Marjie added stencils, masks, and a bit more stamping to fill the page. These birds are such fun to play with, and come in a wide variety of shapes and sizes! Though they are solid, each one has openings that allow your background colors to show through. Great stamps designed by Godelieve! You can find the Carved Birds Vol 1 & Vol 2 stamp sets here! Hi everyone! It's Sephi here! 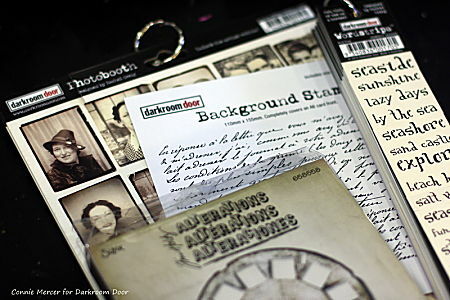 I love the new Darkroom Door rubber stamps sets and I was lucky enough to receive the Travel Inchies stamp set. 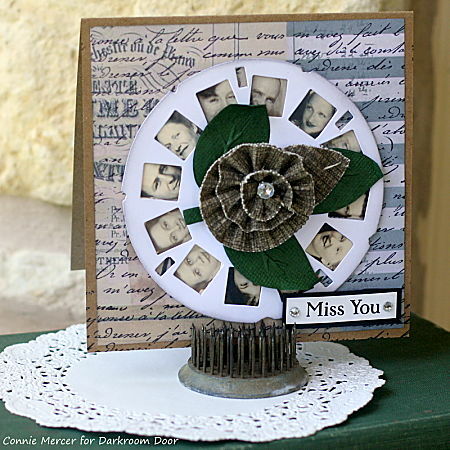 I couldn't resist a vintage/collage look when I settled down to make my samples and I have two cards to share with you. 1. 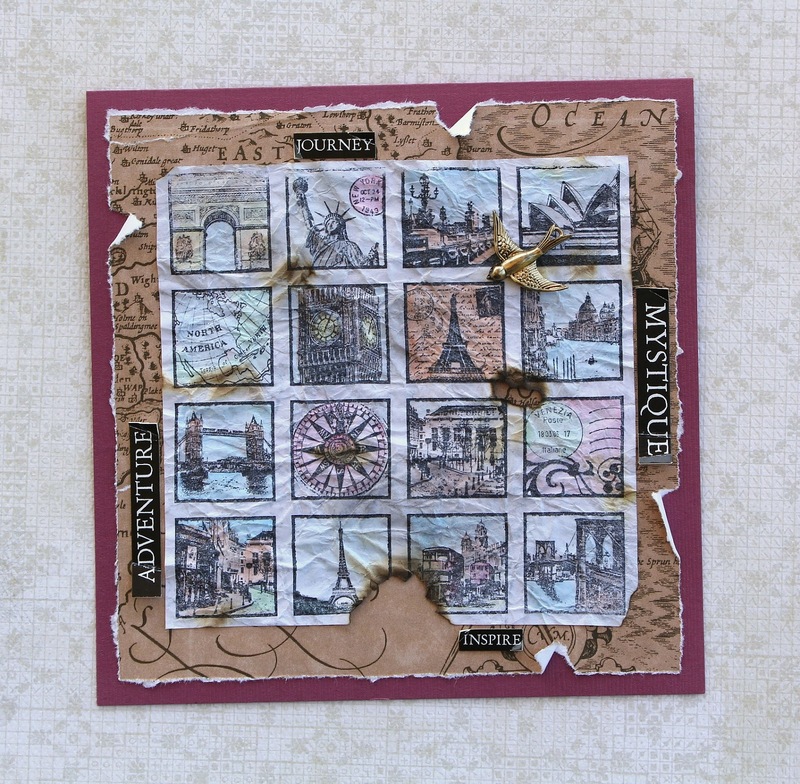 Coat the Travel Inchies stamp with Distress inks (use a variety of colours). 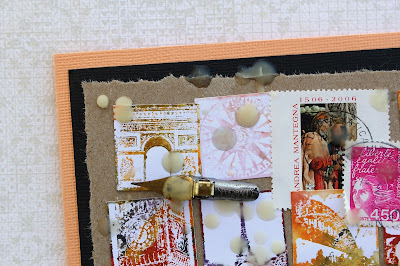 Mist the stamp with water and gently press it onto white paper. When the ink has dried cut fourteen inchies from the impression. 2. 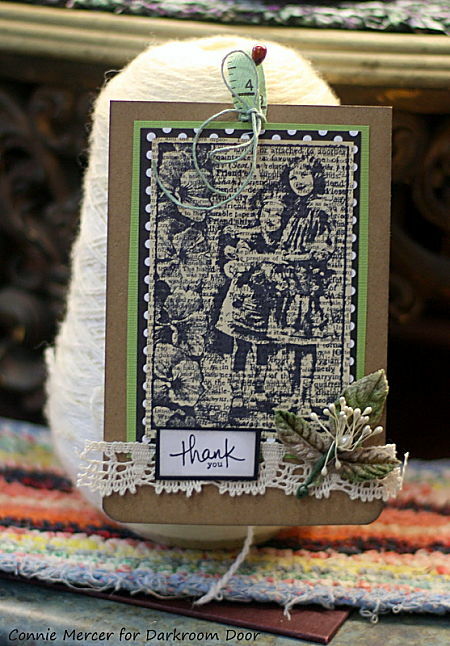 Arrange the inchies on torn kraft paper. 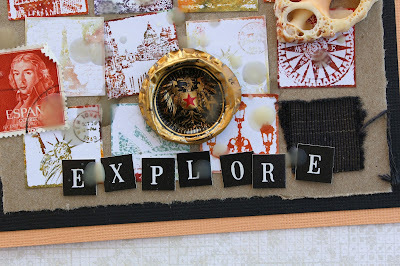 Collage over the top with found and vintage objects. 3. Use alphastrips to create the 'explore' sentiment. 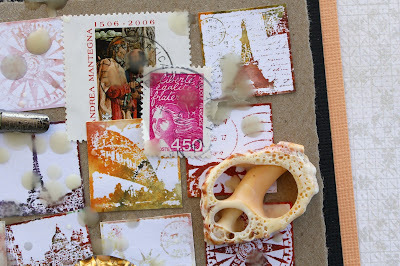 Melt beeswax over the design with a heat tool. 4. Adhere the kraft paper to black card and then to the card base. 1. 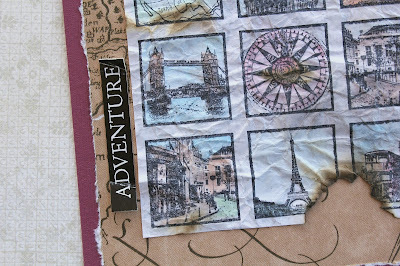 Stamp the Travel Inchies on white paper using black ink. Watercolour the inchies and then douse the paper with water. 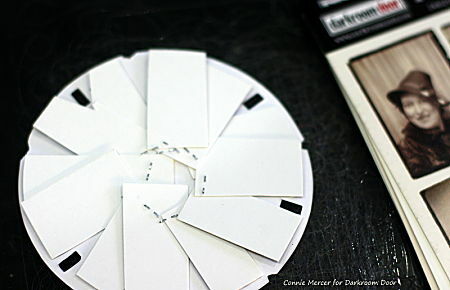 Scrunch the paper into a ball, smooth it flat and set aside to dry. 2. Carefully scorch the stamped paper with matches before mounting on torn map paper. 3. 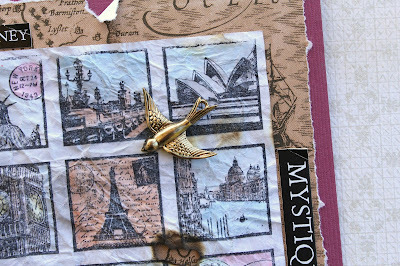 Affix a bird charm with glue and attach the Prague wordstrips as shown. 4. Mount on folded card. Carved Birds - Kids Party Goodies! Hi everyone! It's Belinda here today! 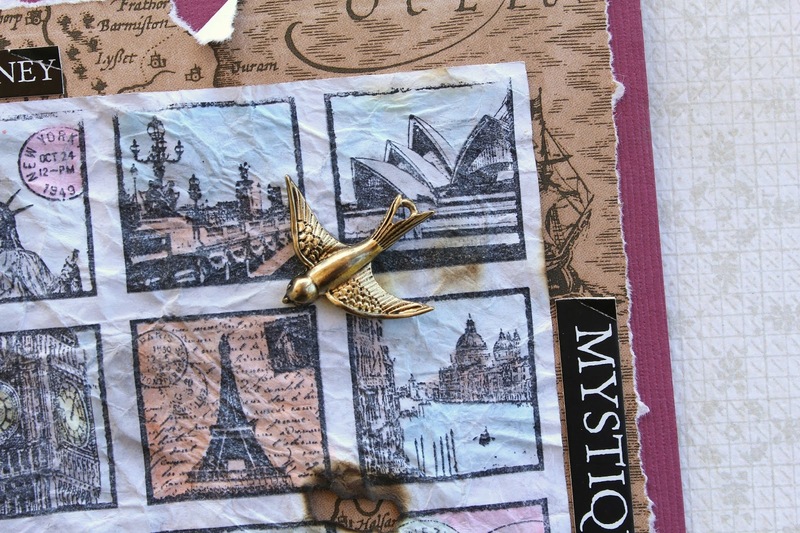 As soon as I saw Godelieve's adorable Carved Birds stamps I knew exactly what I wanted to create with them. So I set about creating a birthday card, thankyou card, cupcake box decoration, cupcake topper, gift tag and goodies bag. 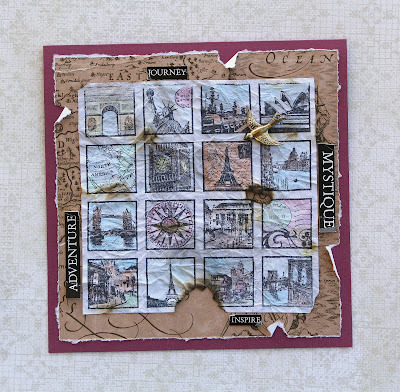 I coloured the various stamps in the set using Tim Holtz Distress Markers, spritzed with water and then stamped onto white cardstock. This gave them a lovely watercolour effect. I created the backgrounds by drowning some white cardstock in Dylusions Ink Sprays and water and allowing to dry completely. I then cut to size and applied the Chevron background stamp with embossing ink before heat embossing with white embossing powder. 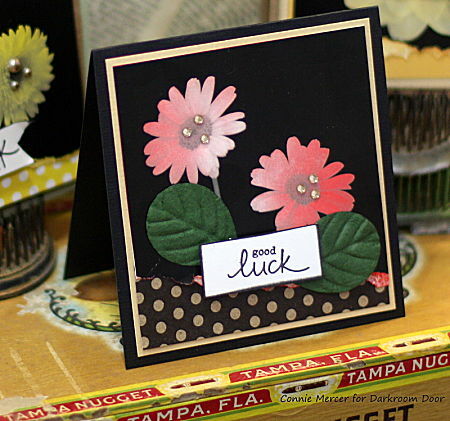 For the cards I added the backgrounds to kraft bases before adding torn strips of kraft and chevron washi tape on top. For the fun cupcake topper I simply punched two circles from the coloured backgrounds and glued them together with a toothpick in the middle. 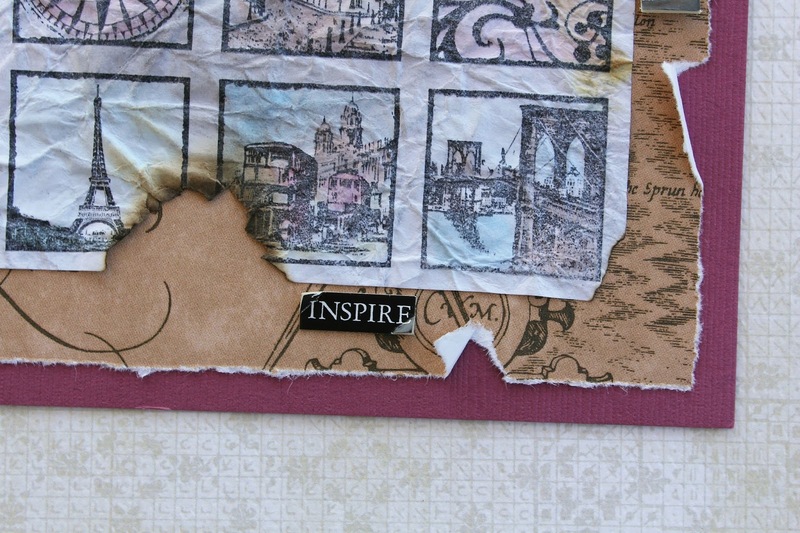 To create the sentiments on all of the pieces, I stamped both the Smile and the Creativity Word Blocks on white cardstock with Pickled Raspberry Tim Holtz Distress Ink and cut out the individual letters as required. I hope I have given you some ideas for your next child's party. Thankyou so much for stopping by the blog today. Hi everyone! 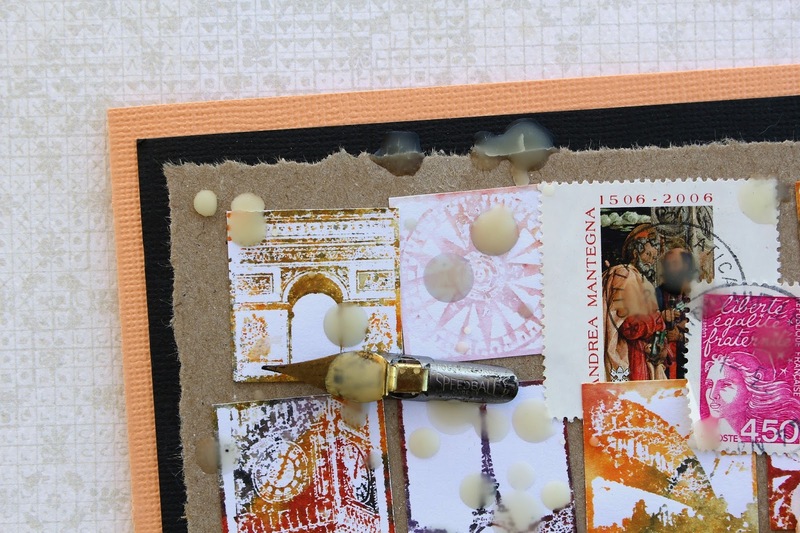 It's time for us to share some creations using the new stamps! 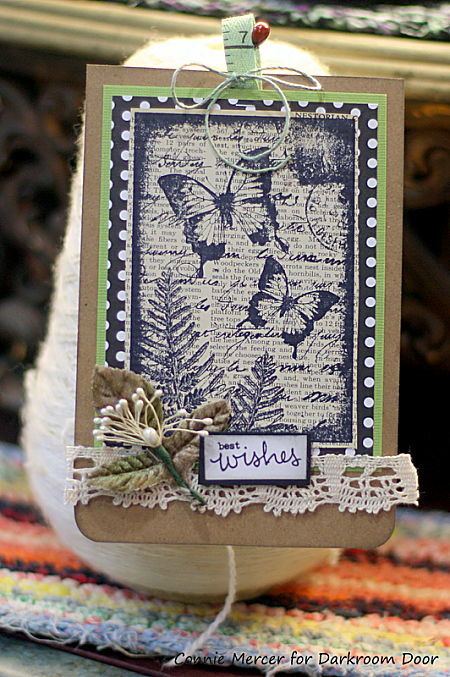 First up is a card I have created using the Carved Birds Vol 1 stamp set. This cute stack of birds is one complete stamp, I've just used 4 different ink pads to ink it up, masking the birds as I went so the ink would only go on the one bird at a time. I started from the bottom bird using Archival Venetian Orange ink. The next bird is inked with Archival Aquamarine. The next bird is Archival Chrome Yellow and the little birdy on top is Archival Rose Madder. Don't they look so cute and colourful? I love this stamp!! Big thanks to Godelieve for designing these birds for us! A big congrats to the following ladies for commenting on our previous blog post! 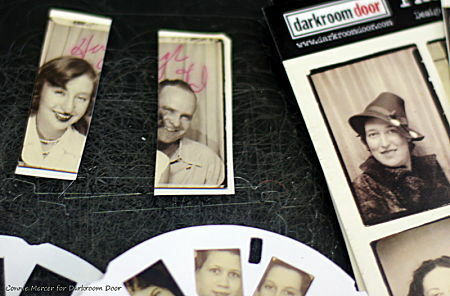 Please email us at info@darkroomdoor.com with your name and address and we'll ship out your prize! Loooove the birdies and the Christmas trees! The quote stamps would fit well in my Art Journal. Great collection Rachel! 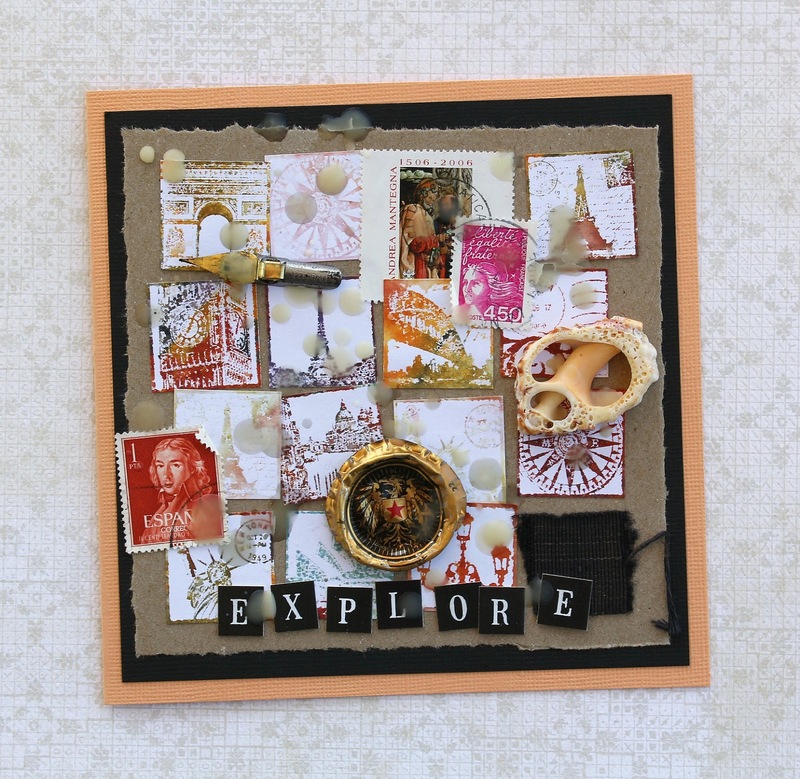 New Release: Essentials 12 Collection, Photo Stamps, Eclectic Stamps & Quote Stamps! We'd also like to intriduce two new stamp ranges - 'Electic Stamps' and 'Quote Stamps'. 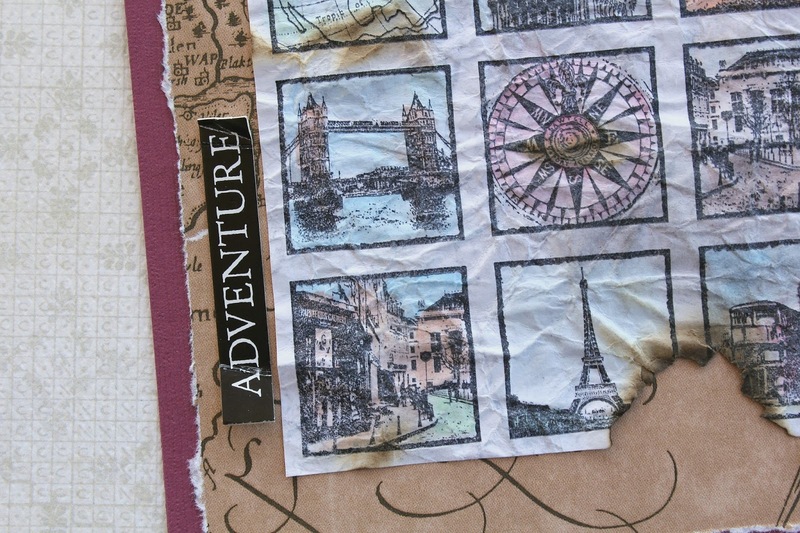 These are available as single stamps and are suitable for card making, art journals, scrapbooking, mixed media and more! We'd love to hear what you love about these new stamps! Please share in the comments and we'll give away a few prizes next week!